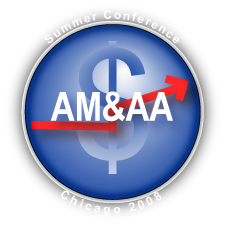 The sub-prime induced correction of the U.S. financial sector has changed the context around M&A during the last year, and mergers and acquisitions experts met last week to share success stories, lessons learned and admonitions at the Alliance of Mergers & Acquisition Advisors Summer Conference July 22-25, 2008 at Chicago’s Wyndham Hotel. I was asked to present a new talk, “Leveraging a Web 2.0 Ecosystem to Grow Your Business,” and I had the opportunity to attend some of the other sessions. I’ll summarize their key points before adding some thoughts on the promise that Web 2.0 and social networks bring to deal marketing due to significantly decreased transaction costs. Over-Publicized Problems and Unusual Opportunities—A Way to Monetize Collaboration? Financial Markets World held its conference, Web 2.0/Enterprise 2.0 in the Capital Markets Industry, in New York City on 17 September 2007. Invited as a panelist on the bleeding edge track, “Web 3.0: Where Are We Going,” I nonetheless had time to scribble some notes to cover some of the sessions. Enterprise 2.0 is being adopted by investment banks and the capital markets industry, but adoption is being dampened by two flies in the ointment: 1) the industry is highly regulated, and compliance forces firms to have control of their data, which means CIOs are hesitant to try new technology that may introduce risk; 2) enterprise 2.0 doesn’t yet have a locked and loaded business case. It’s early, and all conference sessions reflected that. The Global Human Capital Journal’s coverage of Financial Markets World’s Web 2.0 in the Capital Markets Industry conference continues. In this session, Dion Hinchcliffe, a leading writer and consultant in Web 2.0 and Enterprise 2.0, described how capital markets firms were adopting Enterprise 2.0. After some general points on enterprise 2.0 adoption, he referenced early work of Dresdner Kleinwort, AOL, T. Rowe Price, Wells Fargo and JP Morgan. As usual, I’ll summarize his remarks before sharing my analysis and conclusions.